I’m beginning to think about what to do with the main stairs in our new house, which is (still) under construction. I know that, for reasons of safety and aesthetics, I want to do a rug runner from the first floor to the second floor, but I’m unsure on just about everything else – color, material, style, width, etc. Lots to think about. In the meantime, I wanted to share some of the more interesting runner treatments I’ve come across – including one that isn’t a rug at all. Vertical stripes guide your eye up (or, in this case, down). Mitered edging on the landing to turn the corner. Design by LDa Architecture & Interiors, via Houzz. An organic design that looks formal, yet could also work well for a casual beach house. This one gradually widens with the staircase as it comes down, leaving the same amount of exposed dark-stained treads and white-painted risers. The runner comes all the way to the floor, which emphasizes the botanical motif. Via House Beautiful. 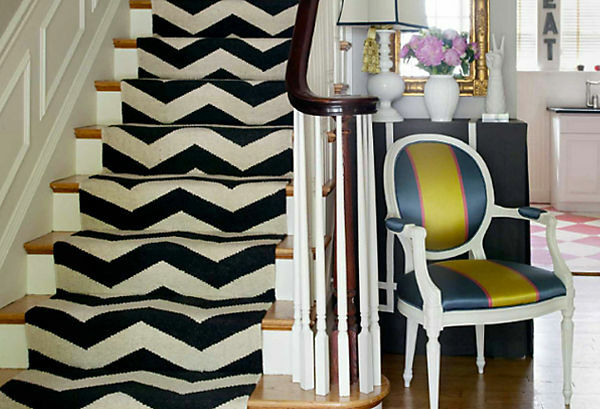 A casual hooked chevron runner gives this staircase a personality boost, and tells you exactly where to go with its up and down ‘arrows.’ Designed by Newton’s own Liz Caan, via One King’s Lane. You know I am a fan of this one – a lime green medallion-patterned runner! This one goes wall-to-wall, completely covering the stair treads and risers, and ends at the bullnose of the first step for a polished look. 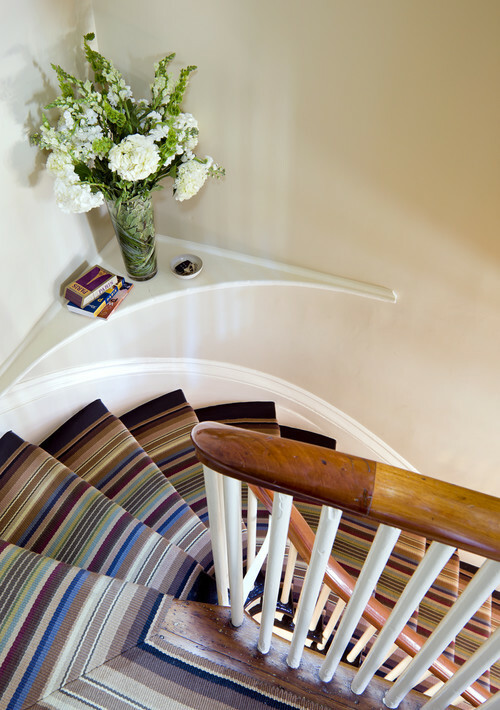 Without this contemporary pattern, I think this staircase would appear dull and dated, but with it, it’s fresh and cheerful. Via studio | ten | 25 blog. 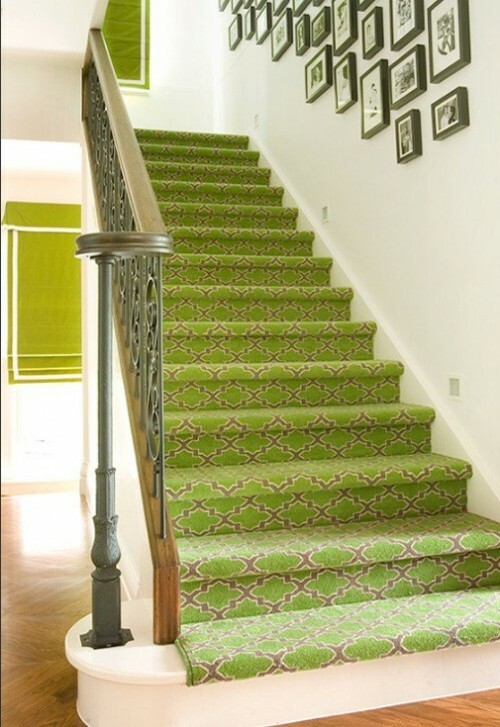 I’ve seen a lot of painted stair runners online, even some that used typography, wallpaper, etc. – all very creative. I have to say though I find most of them attractive, I have concerns about safety – not because of the surface itself, but the visual aspect. It’s hard to tell, in many cases, where to step, which could be even more challenging with kids and the elderly, or anyone with less-than-perfect vision (or attention!). There are some good examples, though, and they work not only on an aesthetic level but also a functional one. Case in point – the above nautically-inspired stairway, designed by Jonathan Adler (via Pinterest). 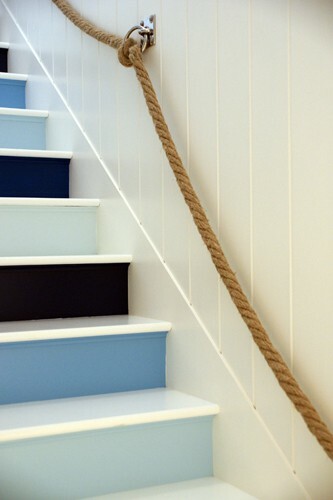 The differing shades of blue contrast with the white treads, and help move you up the stairs. Which is a good thing because that rope railing isn’t going to break your fall very well! I like how it is a classic design, but looks contemporary at the same time. And, of course, the Greek key border :). I don’t want to have to replace this thing in 5 years!! 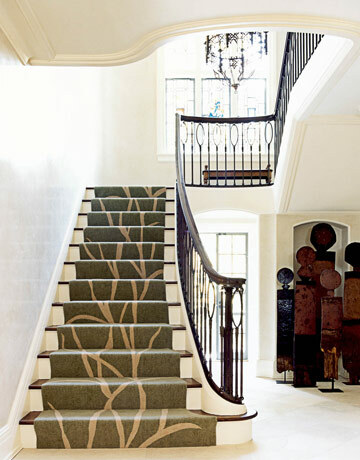 The rug is Nourison from the Cosmopolitan Collection (photo via Landry & Arcari). Previous articleDesignNot My Cup Of Tea...Or Is It? Kel, that’s so funny– the last picture you posted (the Nourisson) is the one being installed at my house (although in a different color!) It will be installed Aug. 6th, so you can come check it out! OK, that is too weird! I had no idea. Can’t wait to see it (and you) this week! Help! I would love this rug but can’t find it. Can you give me more details- like where you got it and the name? Thank you!!! Deborah – all I know is that it is a roll runner by the manufacturer Nourison, from their Cosmopolitan Collection. I bought it from a to-the-trade carpet showroom, but Nourison can be found at retail carpet stores, such as Landry & Arcari in Boston and many others. I actually had to return it when our purchase of this house fell through – didn’t have anywhere else to use it. Still love it, though! Is this a runner for the hallway? This is a Nourison roll runner, which can be installed on a staircase, or on a flat floor (though you would likely want a bit extra length for the latter to splice some border onto the short ends). A dealer that carries this line/product can help with this. A yes or no answer would have been sufficient. Your answer makes no sense. I’m sorry you didn’t find my response helpful, Lorraine. I wish you the best with your home decorating projects. I just ordered that rug with my fiancé! 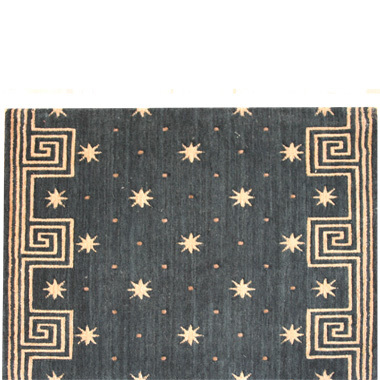 It is by Nourison -Cosmopolitan Midnight and they are making a 2.3x8ft rug for us and the same star design but in ‘Grey’ (looks light blue/cream stars and design) in 5x8ft for our living room. Can’t wait to get them! You can get them custom made in certain stores.